SPINOSO 96 • SHOPPING CENTER BUSINESS • May 2018 place" for the community. • Reconnect the mall to its community through aggressively activating the prop- erty with events and programming that resonate with the year-round residents and tourists alike. Spinoso expects the property to be over 90 percent leased by year's end and many new tenants have opened, and continue to open. According to Spinoso, "The most rewarding aspect of the success we are enjoying in Santa Fe is to see the community's reaction. We are forming new friends, customers and relationships daily. The mall had become almost an embarrassment as a result of decades of decline. Now, it is filled with people, smiling faces, customers shopping, and a new sense of purpose. 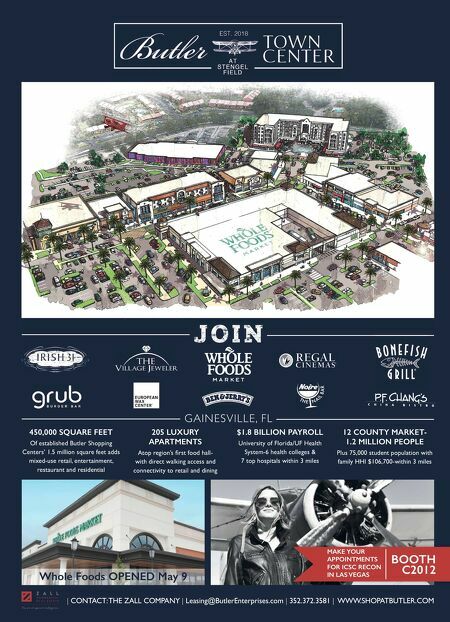 The communi- ty has responded so positively to all the new stores, and dining and entertainment choices. As our mall is re-established into the fabric of the community, we continue to challenge ourselves on how we can take it to the next level." 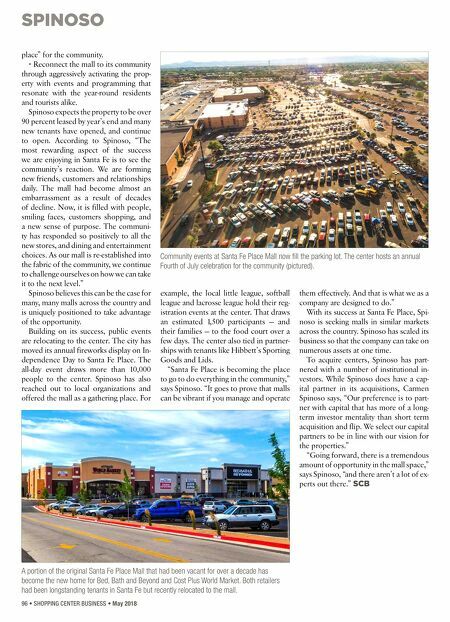 Spinoso believes this can be the case for many, many malls across the country and is uniquely positioned to take advantage of the opportunity. Building on its success, public events are relocating to the center. The city has moved its annual fireworks display on In- dependence Day to Santa Fe Place. The all-day event draws more than 10,000 people to the center. Spinoso has also reached out to local organizations and offered the mall as a gathering place. For example, the local little league, softball league and lacrosse league hold their reg- istration events at the center. That draws an estimated 1,500 participants — and their families — to the food court over a few days. The center also tied in partner- ships with tenants like Hibbett's Sporting Goods and Lids. "Santa Fe Place is becoming the place to go to do everything in the community," says Spinoso. "It goes to prove that malls can be vibrant if you manage and operate them effectively. And that is what we as a company are designed to do." With its success at Santa Fe Place, Spi- noso is seeking malls in similar markets across the country. Spinoso has scaled its business so that the company can take on numerous assets at one time. To acquire centers, Spinoso has part- nered with a number of institutional in- vestors. While Spinoso does have a cap- ital partner in its acquisitions, Carmen Spinoso says, "Our preference is to part- ner with capital that has more of a long- term investor mentality than short term acquisition and flip. We select our capital partners to be in line with our vision for the properties." "Going forward, there is a tremendous amount of opportunity in the mall space," says Spinoso, "and there aren't a lot of ex- perts out there." SCB A portion of the original Santa Fe Place Mall that had been vacant for over a decade has become the new home for Bed, Bath and Beyond and Cost Plus World Market. Both retailers had been longstanding tenants in Santa Fe but recently relocated to the mall. Community events at Santa Fe Place Mall now fill the parking lot. The center hosts an annual Fourth of July celebration for the community (pictured).